In The Guardians of Eastgate 2nd edition you had the chance to go back and rewrite some things that you felt needed to improve. What were the areas you focused on and how did you overcome the challenges? The areas I focused on the most were dialogue and action – showing versus telling. I also took the opportunity to develop the characters and the seer people a little more. As the author, I already knew my characters, but I thought it would be good to reveal a little more about them to the readers as well. It didn’t really feel like a challenge, exactly, to write more dialogue and action, and to develop the characters more. I think it was more of getting past an internal block on my part, rather than whether or not I could write that way. Once I started doing it, I really enjoyed fleshing out the story action and characters. What I needed to do was to slow down and be patient, and to be confident in my story and my characters. What I mean by that is, I needed to allow the characters to live out the story in their own words and actions, instead of wanting to just hand it to the readers from a narrator’s perspective. I think there was a little nagging voice of self-doubt when I was writing the first edition that I needed to get past in order to put my story out there more fully. Looking at the novel a second time, what were some things that changed for you while writing? I think I rushed too much with the first edition. I had this idea in my head for over twenty years, and I wanted to get it out there to the world. There was a fear or an urgency where I think I worried that if I didn’t get it out there asap, I wouldn’t follow through and the story would never make it out into the world. With the second edition, I had to take more time. I had hired a cover artist to do the covers for the rest of the series and I decided to re-do the cover of the first as well, so that the series would be uniform. Then we decided this would be a great time to work on the series and brand logos as well. At this point in the game, I was also doing a lot of reading on the writing craft itself, such as on self-editing, outlining and structuring novels, and so on. Since the cover art, brand and logos would take a while anyway, and I would be putting out a second edition because of the new cover, I decided this would be a great opportunity to work on some of the elements in the first edition that I wasn’t happy with. I think the overarching change for me here was that I realized I needed, and wanted, to slow down and enjoy the process. I read a lot and practiced, and I started to become more confident in my work and my capabilities. So, I feel more comfortable in putting more into the stories, which is essentially putting myself out there. I also believe I can better prioritize the story itself over getting it out there quickly. After all, a good, well-written story trumps getting it out there fast. I understand that you have a third dan black belt in Taekwondo. What made you pursue Taekwondo and do you feel it helped you in writing fight scenes? I have been a student of martial arts since I was 15 or 16 years old. I started in high school with Kenpo Karate. I’m from a small town in Newfoundland, and there were no other choices in martial arts around to consider at that time. You could say that my sensei had the market cornered in our area. But I really enjoyed it. When I went to university, I switched to Aikido, mostly because I was a poor student, I lived on campus, and I didn’t have a car. So, I studied the martial art that was available to me on campus. It is a completely different style of martial art than karate or Taekwondo, teaching more about “moving off the line,” which I reference in my books, and using an opponent’s body weight and momentum against him or her. So, I am glad I practiced Aikido for those years because it gave me a different point of view and helped me to understand movement and defense better. Once I began teaching, moved to a larger city, and had my own vehicle, I suddenly had more options available to me. I found a school that taught Taekwondo, and I really enjoyed it. At one point, I decided to use my degree to work and travel, and I went to South Korea to teach English. For any who don’t know, Taekwondo is the South Korean national sport, and most young people study it at some point. I found out that a student’s father, who didn’t speak English, was a Taekwondo master with his own school. So, I asked my supervisor, a Korean man who spoke English, to ask if I could join his school, and he agreed. Considering that the students in that Taekwondo school had one hour of lessons/practice FIVE days a week, and six days a week in every month leading to a test, I was able to progress quickly in the two years I was there. And I continued with it when I returned to Canada. After living in South Korea for two years, I now feel a connection to this particular martial art because I have a better understanding of the historical and cultural significance of it. I do think it helped me with my fight scenes. I know what is possible and not possible, how to move to attack, defend or counter attack, and so on. Of course, I write fantasy, so my characters can be faster, stronger and more agile than real humans (although, you might be surprised at what some Taekwondo students can do), but I believe my training helps me to keep it fairly realistic. I don’t really like people fighting in real life when it’s not for sport, but put it in a sport setting, or in an action movie (I love action movies), and I think it’s pretty exciting. I don’t know that everyone who reads my fantasy novels enjoy that same kind of thing, but I think that having this training enables me to better convey the anticipation, the skills, the subtleties, and the back and forth between opponents in a clear and exciting way. Have you begun writing book two in the series? When will it be available? The rough draft of Book 2 is about 85% complete. Progress lately has been slow, with working to get this first book out there, my full-time job and my family. I am really enjoying the story and I’m looking forward to getting it out there. Most days, I wish I could devote more time to it, but there are other things that take priority at the moment. For example, I am looking into having this book, The Guardians of Eastgate, made into an audiobook. I have had a few readers ask about that prospect, and I think it is a good idea, so I want to try and make that happen. My original goal was to have Book 2 ready to publish in mid to late spring. Now that I am looking into making an audiobook of Book 1, however, it will likely be published in the summer. I will be posting updates on my website and social media, so stay tuned! The magical realm of Sterrenvar is a world filled with fantasy creatures, swords, sorcery, action, adventure, seers, shifters and sorcerers. It is a realm divided by differences, where the inhabitants keep mostly to their own species or race. When a group of seers are warned through visions of an evil, dark sorcerer intent on ruling the realm, seer champion Maelona Sima must set out for Eastgate to defend a magical keystone that can help protect the realm. Along the way, she must gain allies and convince the differing peoples of the realm to stand together as one to save their world from its biggest threat in three-thousand years. This new, expanded and revised Second Edition of the Guardians of Eastgate (Seers Book I) includes an extra 12000+ words worth of added dialogue and extended scenes. The Guardians of Eastgate, 2nd Ed. 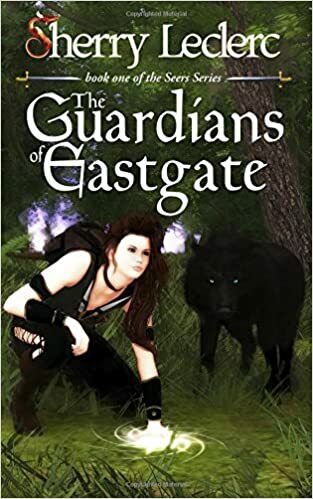 In The Guardians of Eastgate Maelona, one of the four champions of the Seer race, is tasked with protecting the realm of Sterrenvar from an ancient evil that threatens the land. Maelona struggles to protect the very people who once hunted and killed the Seer race out of fear and mistrust. Maelona and the other Seers fight to protect four keystones from being breached by evil forces. Maelona soons finds that this proves to be an incredibly difficult job. Is she up to the challenge? She teams up with her friends, a wolf shape-shifter, and a human prince, on her quest to save Eastgate from destruction against evil forces. 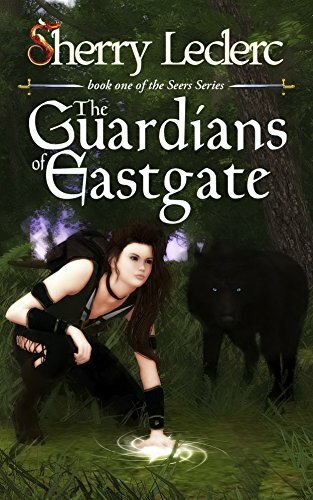 The Guardians of Eastgate by Sherry Leclerc was an amazing read. The first edition felt more like an outline of the story it didn’t dive into the detail or flesh out the characters. It felt more like a summary of an existing story. This second edition was far better, from extended scenes to extended dialogue which makes helps to develop a rich and complex plot that is both easy to follow and leaves you wanting more. Leclerc takes us on a beautiful journey in a world filled with fantastical creatures, sorcery, shape-shifters, swords and so much more. It was an interesting choice to make a standard figure of fantasy, the seer, into an entire race of guardians. I cannot wait to explore more of this race in the coming series. They are fascinating, but I felt we’ve only seen the surface of a vast ocean. I was impressed with the complexity and variety of the story line. The author expertly combines elements of romance and mystery into a suspenseful read, that includes an array of compelling characters. The romance between between Maelona and Blaez was intriguing, and lends to the emotional appeal of this novel, but the story is punctuated by some intense fight scenes. If you’re looking for fight scenes that are realistic, Sherry Leclerc has a third dan black belt in Taekwondo, and her expertise is apparent. This 2nd edition of The Guardians of Eastgate, I felt, allows this series to really take off. It’s an appropriate start to a series that is brimming with potential on par with the Dragonlance series. I will definitely be looking out for the next book. I loved traveling with Maelona on her journey and can hardly wait to meet the next champion. You will be sure to enjoy this book if you enjoy magic, sword & sorcery, action. adventure, and romance.